Please browse our gallery which showcase the quality of our bathroom renovation projects. All of our Glasgow bathroom installation images have been taken by our installers, no professional photographers have been employed. We feel that doing so provides customers with a true perspective and appreciation of our workmanship. The image below consists of a combination of Pompei Ivory and Nut tiles complete with border. The walnut furnishings and matching bath panel compliment the contemporary yet classic look. Natural, matching tones are always easy on the eye which is not just important for customers today but also a worthwhile consideration in the long term as well since at some point in the future selling your home may be a possibility. 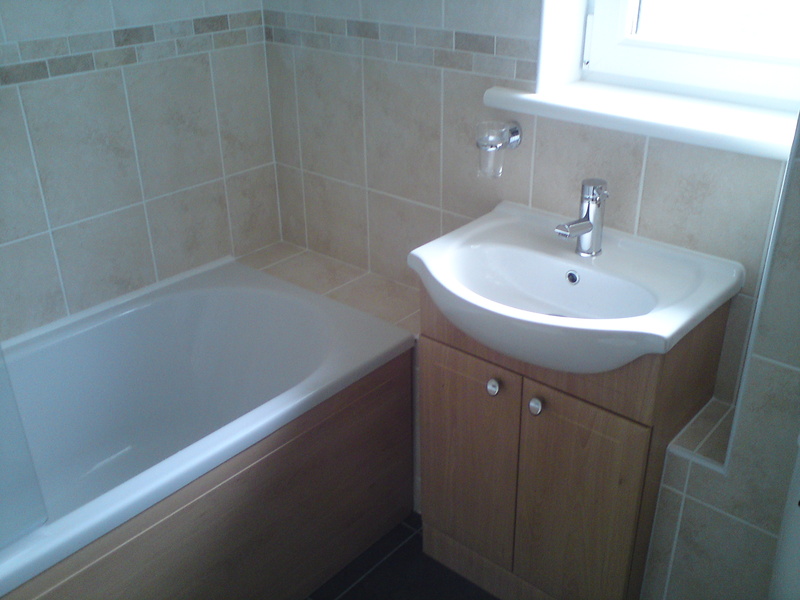 Your Glasgow bathroom designer will be only too happy to discuss your current and future bathroom or en-suite needs, taking these factors into consideration at all times.